Cartwright’s Ranch House opened in 2011, but began as a dream many years ago. Having spent my entire adult life working in restaurants, I dreamed of one day opening my own place. I wanted it to have a comfy, home-like feel that serves outstanding, home-style food….food like everyone’s Mom, Dad, and others prepare at home. Family is a big part of my life, as I have 6 brothers and sisters, so opening a family style restaurant seemed only natural. At Cartwright’s Ranch House, we view our customers as family, so come on down and enjoy our friendly service. Our food is prepared to order, with the only the finest ingredients. I know you’ll enjoy it! 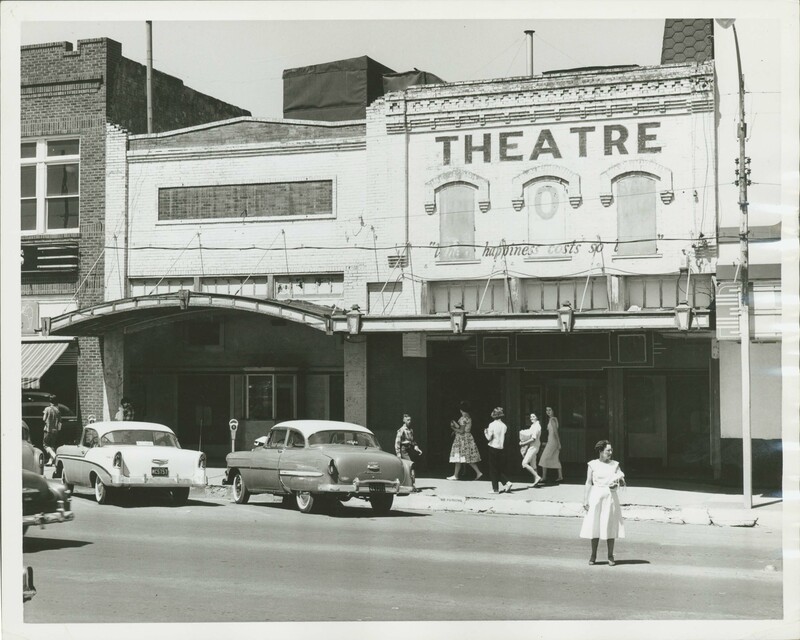 The Cartwright’s location was originally part of Downtown Denton’s “Theater Row” in the 1930’s, 40’s, and early 50’s. 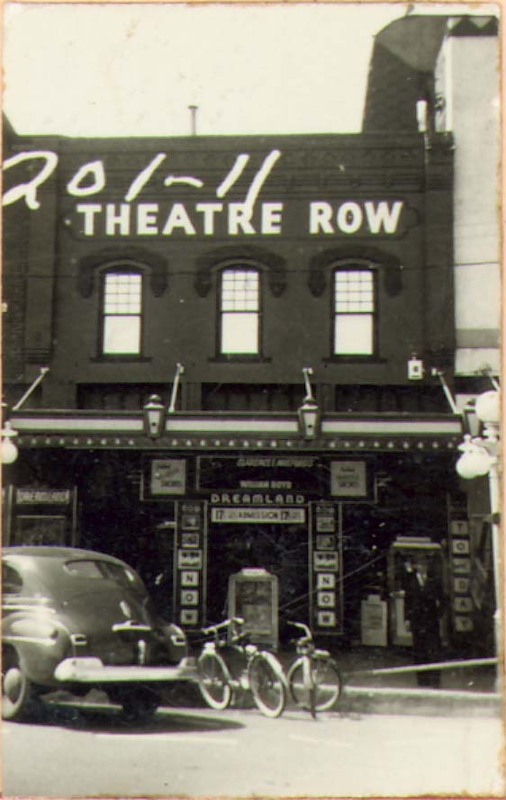 Our location housed “The Dreamland” Theater. It closed and was torn down to build the present day building. The first tenant was a Benjamin Franklin dime store, followed by several other shops and restaurants. Most recently, it was Ruby’s Diner for nearly 24 years. During our renovation, we discovered the brick on the north wall. It was behind 5 different layers of material. The final layer was plaster, directly covering the bricks. On that plaster, a mural had been painted on it that was part of the décor of the Dreamland Theater. It depicted scenes of world landmarks such as Great Pyramids, Sphinx and the Gardens of Babylon. A portion can still be seen above the walk-in cooler, in the back dining room. The entire brick wall is actually the exterior wall of our neighbor, The Fine Arts Theater, built in 1880s. If you look closely at the bricks, some bricks appear “glazed” as a result of several fires over the past century. The Courthouse Square in Downtown Denton has seen many changes over the years, and our location is no exception. Cartwright’s Ranch House is located on the Square’s west-side, and there had just about any kind of store located here. Places like saloons, hardware stores, tailors, drug stores, and the like. Below you can find photos of the west-side of the Square, during the 19th century. 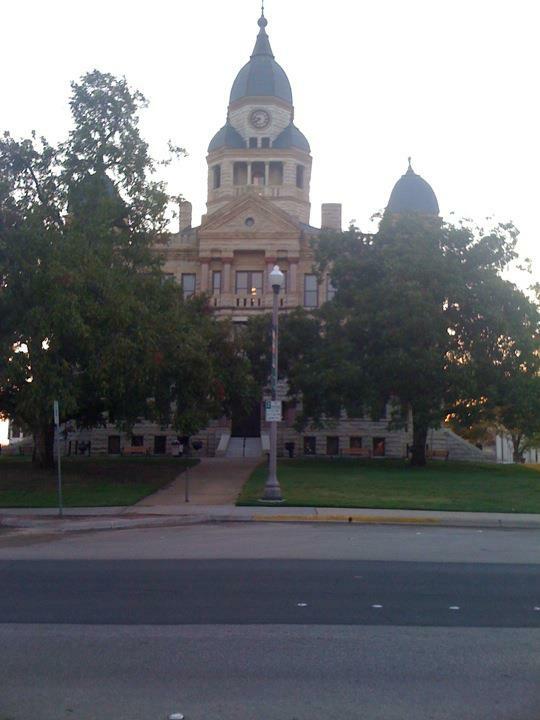 The existing Courthouse was not be built until 1896. Quite a bit of growth can be seen from the pictures.